I’ve been reinstalling Ubuntu (11.04, Natty Narwhal) a lot lately, because my computing environment is in a lot of flux right now. I wiped my desktop computer, have a relatively new laptop, had a laptop at Intel, and now have a desktop at CMU. As a result, my package installation routine is more or less down to a science right now. Here are the packages I am sure to install–and sure to uninstall–right at the start, along with brief commentary. zsh — my shell of choice. vim exuberant-ctags — necessary for editing all manner of text file. haskell-platform — Haskell, with batteries included. texlive-latex-extra (and hence, most of the other LaTeX packages) — I use LaTeX whenever I need to format text. subversion git — these come in handy, even if you don’t use one (or both) of these yourself. compizconfig-settings-manager — to tweak the default Ubuntu settings for window animation, etc. gnome-do — like Quicksilver or Spotlight. nautilus-open-terminal — adds “Open in Terminal” to your context menu. vlc — plays all media files. cmus — my favorite library-based music player. exfalso eyed3 — edit mp3 tags, before importing into library. I use exfalso for the text fields, and eyed3 to add album art. deluge — a good BitTorrent client. libncurses5-dev — needed for Petite Chez Scheme, below. Google Chrome, from official .deb, so it adds the Chrome repository. Petite Chez Scheme, for Scheme. unity ^unity-* — I don’t like the new Unity UI. shotwell tomboy ubuntuone-client — I don’t want these programs. empathy empathy-common — I prefer Pidgin, if I end up using IM. transmission-common — I prefer Deluge. cmus has vi-style key bindings: j/k are down/up, :q quits, etc. It opens instantly, is very responsive, and has a small footprint. 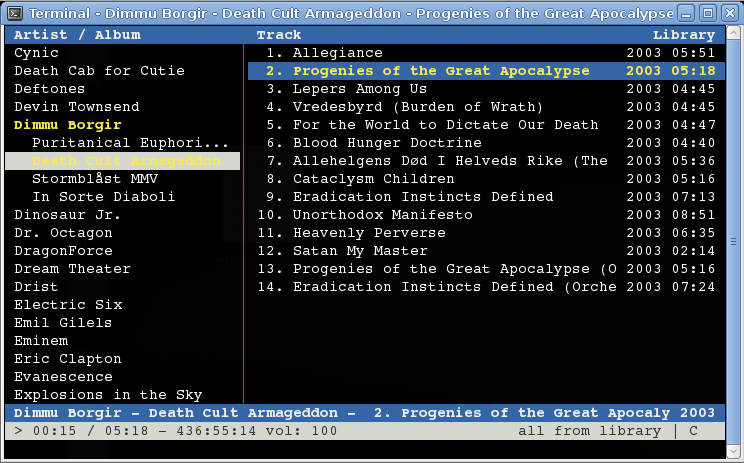 It also has support for remote commands via cmus-remote, and even has a last.fm plugin. If Linux is your primary operating system and you like the terminal, you should give it a try. It even has a Debian package, but unfortunately, stable is back at version 2.2.0, and the current version (2.3.3) has some significant improvements. I compiled the new version, which links with a lot of codec libraries I had to download (libao2, libflac, libwavpack, libvorbis…). But I ran into a weird issue where some albums’ artists were showing up as blank or weird garbage strings instead of the correct names; Songbird didn’t have this issue. I’m an obsessive music tagger, so this really upset my sensibilities. cmus 2.3.3 displays the Album Artist field rather than the Artist, in order to better handle compilations. (This is reasonable, because it sorts by Album second, so it is preferable if each album is only under one artist name.) In the ID3 spec, the TPE1 field represents a “lead artist,” and is typically interpreted as the Artist field; TPE2 is the “band/orchestra/accompaniment” field, but is often interpreted as the Album Artist (most notably, by iTunes). There is a dearth of good ID3 tag editing software, especially on Linux. I primarily use EasyTAG, but it doesn’t support editing TPE2! When a track doesn’t have a TPE2 field, cmus goes by the TPE1 field, and all is well. However, when a file has weird stuff already in TPE2, I get random garbage in cmus. and it solves my tagging problem! It took me a while to figure out exactly what was going on, but now everything is going smoothly. I might switch from EasyTAG to Ex Falso, a GTK-based tag editor (based, like mid3v2, on the Mutagen library) which looks a lot more featureful.